Scott Carey: Relax Doctor. You can't tell me anything I haven't already imagined. Doctor Arthur Bramson: You are getting smaller. I... I don't profess to understand it Mr. Carey. There is no medical precedent for what's happening to you. I simple know that you're getting smaller. The X-rays prove it beyound any doubt. I finally caught up with Jack Arnold's most highly-regarded piece of science fiction, and I have to say that I agree it's his most accomplished work. True, the plot isn't terribly original (how about THE DEVIL-DOLL , which I watched again right after, and DR. CYCLOPS , for starters, not to mention the 'little people' of BRIDE OF FRANKENSTEIN ?) but none of the others quite touched upon the psychology of its admittedly fantastic situation, let alone treat it with such intelligence, sensitivity and, ultimately, persuasion. Legendary author Richard Matheson is to be congratulated for his truly excellent script, as should be Arnold for putting his ideas on the screen with such vividness and imagination. Special mention must go too to Grant Williams for his fine performance; Jack Arnold seemed to think it was worthy of an Oscar and I can't say I disagree! It was interesting to see that the title character's peculiar affliction effected him gradually and not all at once; the fact that this was caused by exposure to radiation must have struck a note of panic amid contemporary anxiety-ridden audiences (this was the Cold War era, after all) and, in any case, it was inevitable that such 'monstrous' radiation effects (as seen mutating various forms of animal life on the screens of 1950s America) would not spare man himself in the long run. An episode featuring sideshow midgets, with whom The Shrinking Man seems to identify for a little while, is quite moving - as is his jealous possessiveness of his wife who he suspects wants to abandon him. Despite the low budget, the film's special effects are terrific and the second half of the story basically resolves itself into a struggle for survival for our unfortunate hero as he has to battle various elements (the family cat, a spider, water, the re-dimension of objects around him, his own weakness due to hunger) which a normal person would more or less take for granted. 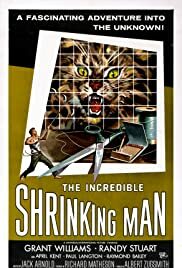 I thoroughly enjoyed THE INCREDIBLE SHRINKING MAN - though I must say that Matheson's bleak yet strangely affecting ending blew me away, giving the film an intellectual resonance lacking in most films of its type and period. 65 of 79 people found this review helpful. Was this review helpful to you?